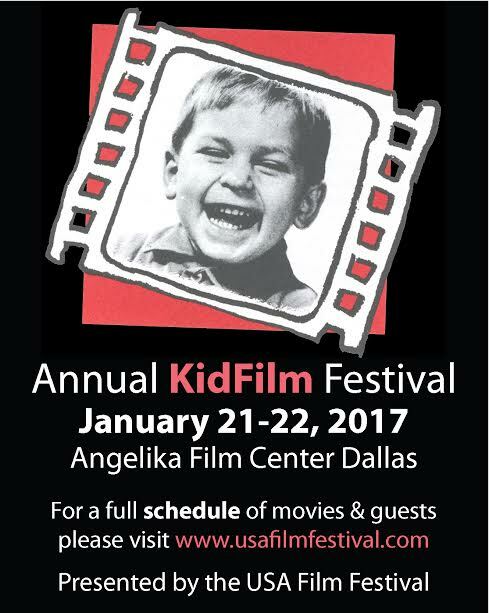 DALLAS – The USA Film Festival announces the schedule of events for the 33rd Annual KidFilm® Festival/Presented by the USA Film Festival Dallas taking place Saturday, January 21 and Sunday, January 22, 2017 at the Angelika Film Center, 5321 E. Mockingbird Lane, Dallas. All programs will be presented FREE to the community. MEET THE AUTHORS AND ILLUSTRATORS! Screenings and read-alongs with all guests -- kids can receive a FREE book to have signed! A Salute to author and illustrator Tom Lichtenheld. The program will include a screening of Groovy Joe: Ice Cream & Dinosaurs, his collaboration with Eric Litwin, followed by a reading and sing-a-long. Free copies of “Groovy Joe: Ice Cream & Dinosaurs” will be distributed at the show (while supplies last). After the on-screen program and reading, Tom will sign books for the kids. A Salute to author Anna Kang and illustrator Christopher Weyant. The program will include a screening of You Are (Not) Small, followed by a reading of their new book “Can I Tell You a Secret?” Free copies of “Can I Tell You a Secret?” will be distributed at the show (while supplies last). After the on-screen program and reading, Anna and Chris will sign books for the kids. A Salute to author Beth Ferry. The program will include a screening of Stick and Stone, followed by a reading of her new book “Land Shark.” Free copies of “Land Shark” will be distributed at the show (while supplies last). After the on-screen program and reading, Beth will sign books for the kids. Free healthy snacks for all kids will be provided at the authors program by KidFilm Sponsor Whole Foods Market. NEW ANIMATED FEATURE FILMS to be presented include The Mice War (U.S.), Kikoriki: Legend of the Golden Dragon (Russia), The Snow Queen 3: Fire and Ice (Russia); Sheep & Wolves (Russia); and Howard Lovecraft and the Frozen Kingdom (Canada). NEW LIVE-ACTION FEATURE FILMS include My Friend Raffi (Germany), Fiddlesticks (Germany) and a special 35mm KidFilm Classics presentation of Benji (1974) (U.S.), as we revisit the beloved pooch who starred in five feature films just before he gets a remake by original writer/director Joe Camp’s son, Brandon Camp. In addition to SHORT FILM PRESENTATIONS of beloved children books adapted for the screen, an additional twenty-two short live-action and animated films from around the world will be presented this year. www.usafilmfestival.com beginning 1/5/17. Printed KidFilm flyers may also be picked up at the Angelika Film Center Dallas beginning January 11th. Tickets for all shows are available day of show only, beginning one hour before each showtime. KidFilm programs for the public and the Dallas Independent School District are made possible at no admission cost thanks to special support from Sponsors -- Carol and Alan J. Bernon Family Charitable Foundation, Dallas Tourism Public Improvement District, Ronald McDonald House Charities of Greater North Texas, Dave Perry-Miller Real Estate, Sidley Austin LLP, Whole Foods Market, The Eugene McDermott Foundation, Mary Fox, CASHSTORE.COM, Gaedeke Group, Headington Companies, Dallas Film Commission, Suddenlink Communications, Jackson Walker, L.L.P. and the Angelika Film Center. Tom Lichtenheld doodled his way through school then worked as a sign painter, set designer, printer and art director. After a long career in advertising he accidentally (on-purpose) switched to creating children’s books. His work is noted for its humor, expressive characters and rich detail. He creates books that appeal to children and adults alike, and his portfolio of over twenty books offers something for every age. A number of his books, including Stick and Stone, created with Beth Ferry, and Goodnight, Goodnight, Construction Site, created with Sherri Duskey Rinker, have been New York Times Bestsellers. Anna Kang was born in the Bronx and grew up on Long Island where she spent most of her free time reading Teen Beat magazine, Archie comics, and watching movies at the local multiplex. She studied International Relations and Asian Studies at Tufts University and Nanzan University in Japan, then followed her heart and moved to Los Angeles, where she received an M.F.A. from USC's School of Cinematic Arts and discovered what made her happy -- telling stories. After graduating, Anna was selected to participate in the Sundance Institute's Screenwriters Lab and Film Independent's Directors Lab with her first feature script, The Lost Tribe of Long Island. All of her experiences - personal, professional, and creative - led her to write her debut picture book, You Are (Not) Small. Being able to create it with her talented illustrator-husband, Christopher Weyant, made the journey all the more rewarding for Anna. Since creating their first book together, the duo has gone on to create two additional books thus far: Can I Tell You A Secret? and That Is (Not) Mine. Christopher Weyant is a native of New Jersey and product of twelve years of Catholic School. Both experiences led to a life of humor and satire. A cartoonist for The New Yorker, Chris’ work has been published worldwide in newspapers, magazines, books and online, and he has worked on numerous national advertising campaigns. His cartoons are in permanent collection at The Whitney Museum of American Art and The Morgan Library & Museum in New York City. In 2014, the Nieman Fellowship for Journalism at Harvard selected Weyant to be a Nieman Fellow, the second cartoonist to receive that honor in Nieman Foundation's seventy-five year history. Chris' work has been featured on “The Today Show,” “Meet The Press,” "ABC News With Diane Sawyer" "Late Night with Seth Meyers", CNN, MSNBC, and Fox. He is the winner of the 2015 Theodor Seuss Geisel Award for his first illustrated children's book, You Are (Not) Small. Chris graduated from Gettysburg College with a B.A. in Political Science and Economics planning on a career as a lawyer. He gave it all up for a pen and a brush, and now lives outside New York City with his wife, Anna, and their two daughters. Beth Ferry grew up by the beach where she spent most of the day reading. Her favorite childhood memories involve sun, salt, sand, and scribbling stories. She adores alliteration and the magic of rhyme done right. Her favorite word is anticipation and she loves the feeling of holding a book in her hand because she knows, through personal experience, that the book is holding her hand right back! Holding her own book, and having that dream come true, has been a feeling beyond compare for Beth. So far, she has written three children’s books: Stick and Stone, Land Shark, and Pirate’s Perfect Pet. Beth currently resides in New Jersey with her husband, three children and two bulldogs. Now celebrating its 47th year, the USA Film Festival is a Dallas-based, 501c3 nonprofit organization dedicated to the encouragement and recognition of excellence in the film and video arts. The Festival’s year-round programs and events include KidFilm, special monthly programs and premieres, TexFest, and the USA Film Festival held each spring. The USA Film Festival is supported in part by the City of Dallas Office of Cultural Affairs and the Texas Commission on the Arts. More information about the Festival is available online at www.usafilmfestival.com.